Any passing thought that David Bowie was a casual or poorly informed collector of art disappears within moments of viewing his remarkable collection, shortly to be sold at a special three-part sale in Sotheby’s London. The Sotheby’s sale consists of some 350 lots which, we are told, represents about half of his collection. Unfortunately we don’t know what has been saved – presumably the most personal and best pieces – but this is a tantalising look at the taste of one of the most remarkably creative artists of our times. What we mostly find is a truly varied and comprehensive roll call of Modernist British art from the likes of influential painters like David Bomberg, Frank Auerbach, Leon Kossof and Peter Lanyon. Alongside are modernist sculptors like Kenneth Armitage, Henry Moore and William Turnbull. Bowie was also happy to put his time and money in to the lesser known – if he liked them – British artists like Alexander Mackenzie and Maurice Cockerell. He also bought outsider artists and invested in South African art. There are other gems too. A pretty good Basquiat or Damien Hirst spin painting? A Tintoretto anyone? German expressionist etchings? There is also a small, but important selection of early conceptual and surrealist artists like Marcel Duchamp, Man Ray, Francis Picabia and Meret Oppenheim. And then there is the furniture and design. Memphis burst out of Milan in the 1980’s with Ettore Sottsass revolutionised cutting-edge design, introducing fun, humour and strikingly bold colour combinations into functional pieces. The ‘Casablanca’ Sideboard, from 1981, is considered a defining work of postmodern design as was the Olivetti Typewriter upon which Bowie typed his lyrics and that directly led him on to a love of Memphis and this broad and impressive collection. Estimates are often very reasonable and at first glance it looks like it is possible to pick up some small works in the mid hundreds. There are other items like the 1966 Castiglione radio-phonograph at £800-1200 and a Brionvega cube radio estimated at £150-250, both tantalisingly priced. Sadly however these are all at fantasy prices to draw in the eager; you can probably add a nought to each before you even start. Good luck! Postscript: I should have said ‘add two noughts’. 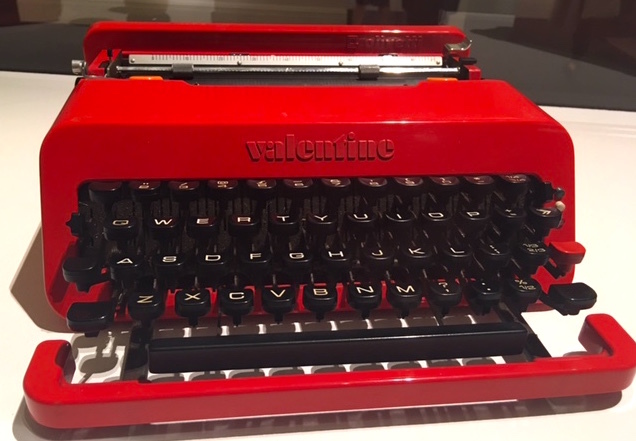 The Valentine typewriter sold at £45,000, The Castiglione Radio-Phonograph £257,000, the Brionvega Radio £30,000 amongst many other items that sailed way above estimate. All the low lots estimated in the tens & hundreds went for £4k upwards as everyone wanted a small piece of Bowie memorabilia and the overall estimates on all sales were at least doubled. Basquiat ‘Air Power’ went for a record £7.1m. See BBC feature here. You are currently reading Bowie/Collector at Sotheby’s London at a kick up the arts.